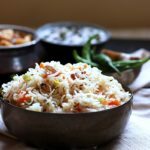 Veg pulao recipe is a delicious, mild and gently flavored rice pilaf with veggies, long grained rice and Indian spices. Tastes best when served warm as main course! Pick and rinse the basmati rice thoroughly. Soak in plenty of water for 1 hour. Drain and spread on a plate. Heat 2 tablespoons oil or ghee in a heavy pan. Add the whole spices and saute for a minute. Add ginger,garlic and green chilies and saute well. Add chopped cilantro leaves and saute for few seconds. Add chopped vegetables and mix well. Cook in open pan for 7-10 minutes. Add the drained basmati rice and saute very well. Saute till all the moisture in rice is gone. Now add 3 1/3 cups of water. Mix well. Add lemon juice. Season with salt. Cook with keeping pan open until the water starts to boil. Once the water bubbles, close the pan with a tight lid. Cook in low medium flame for about 10-15 minutes. Do not mix more than once in the middle. Once done, keep the pan closed for 10 minutes. Open the pan and fluff up the rice gently. Serving Suggestions for veg pulao: Serve with dhaba dal, dal fry or simple raita.